Sunglasses, lifejackets, fish-grips, pliers, rod racks etc. The first lifejacket I have ever used and indeed reviewed for my shore based lure fishing, this Spinlock Deckvest Lite lifejacket is such an easy thing to wear. It doesn’t get in the way when I am fishing, it is nice and light, and it could well save my life if I was to end up in the water. Check out my full review here. You can buy this lifejacket here. Product of the year 2018. Another very easy to wear and not at all expensive lifejacket that is so comfortable and lightweight that yet again it begs the question why not wear one? This Crewsaver Crewfit 165N Sport lifejacket is rather brilliant! See my review here. Can a headlamp for my night based lure fishing get any better? This tiny Nitecore NU25 is the most perfect rechargeable headlamp I have ever used and it doesn’t ever leave my fishing rucksack these days. Review here. Not remotely expensive, but they might just be the best all round wading studs that I ever used. The photo here is of the model 1100 Best-Grip studs in the bottom of my Dunlop safety boots after six months of hard use, and aside from a bit of discolouration I can’t find any sign of wear on these amazing studs. Great things can come in little packages it seems. See my review of these studs here. I don’t use a fish grip thing very much, but I have had this small and very lightweight Fish Grip Jr clipped to my HPA Chest Pack for a while now, and it works perfectly. You won't get far in many kinds of fishing without a decent pair of polarised sunglasses, and these days I am proud to be able to say that I am using the outstanding Costa del Mar ones. There has to be a reason why I come across so many fishing guides and anglers all around the world who choose to wear Costas. See my review here. You can buy Costa del Mar gear here in the UK. Tie me down and allow me to use only one pair of Costa del Mar polarised sunglasses and one lens type and it has to be the Permit frame with the freakishly good 580G (glass) Green Mirror lenses. These wraparound sunglasses suit my face shape, they stop any sunlight creeping in from the side, and they never, ever budge whatever I am doing. They are ridiculously light and comfortable to wear – I have been using the copper 580P lenses and although the 580G Green Mirror is my out and out favourite Costa del Mar lens, these Rockports with the copper 580P are running pretty damned close if you ask me. Out and out class. See my Costa review here. I think I might have found the perfect polarised lens for the kind of up and down light conditions we tend to get. These Costa del Mar Sunrise Silver Mirror lenses are really good early in the morning and later on in the evening, but to me they work so damn well when the light is all over the place, and I especially like how they help so much in lower light conditions. See my review here. Polarised sunglasses of the year 2018. The absolute best lure bag I have ever used for carrying my bass fishing lures around my waist. See here for a full review with details on how I use mine. Best way to carry my lures when I am actually fishing 2018. Without doubt the best waterproof rucksack for fishing that I have found and extensively used so far. Lightweight, easy to carry and much tougher than other waterproof rucksacks I have tried, this HPA 40 litre one is brilliant. It comes in a range of different colours. Check out my review here, and you can buy it direct from HPA in France right here. Outstanding wading studs. Not cheap, but to me they are worth every penny. See my review here. 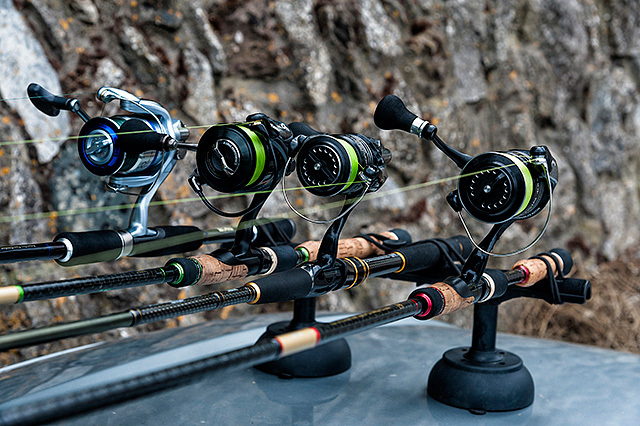 When I go to Ireland I have one of their “Professional Locking Racks” that holds four lure rods and reels easily and securely at any kind of speed you might drive. When I am at home I have a Vac-Rac “Combi Rack” that is magnetic and I simply put it on and take it off my car as and when it’s needed. See my review here. Yes, it’s no joke how expensive these things are, and yes, I accept completely that spending this much on a pair of fishing pliers is alien to most anglers - but there is no getting away from how good these Van Staal titanium pliers are, as in they just don’t rust. The cutters cut all kinds of braid and fluoro for me as well. A complete no-brainer if you ask me. Your hard lures won’t end up in a tangled mess of treble hooks and you can simply dunk the box (with lures in it) in a sink of freshwater if you are so inclined to rinse your lures down. I can fit two of these washable lure boxes in my HPA bag, and if that isn’t enough hard and soft lures for a bass fishing session then I should be giving myself a thrashing.